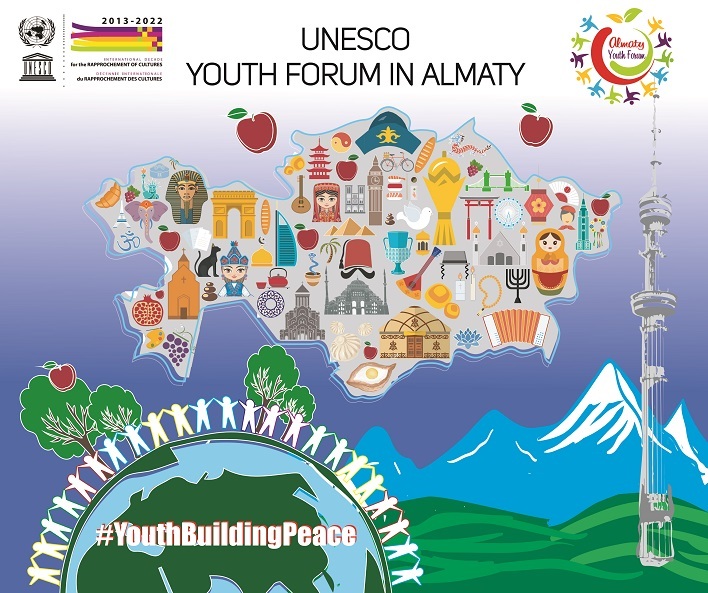 On 8 September, 2017 in Almaty the II International UNESCO Youth Forum: "Youth cooperation in the field of strengthening intercultural dialogue and prevention of violent extremism" within the framework of the International Decade for the Rapprochement of Cultures (2013-2022), the International Youth Day (12 August), International Literacy Day (8 September), as well as International Week of Media and Information Literacy will be held. The Youth Forum will bring together about 100 young participants from different countries to discuss the promotion of intercultural and interreligious dialogue in the region, as well as the rapidly growing problem of modern society such as violent extremism. • "The religious stereotypes: roots, consequences and methods of prevention" - Aliya Khassanova, 28 years old, Kazakhstan. • "Experience of the Kazakhstan National Federation of UNESCO Clubs in promoting international understanding and the role of youth education in the formation of a peaceful and sustainable society" - Bahytgul Kubeyeva, 24 years old, Kazakhstan. • "Creating a comfortable platform for the integration of youth through education" - Saierakhon Gapurova, 19 years old, Kyrgyzstan. • "Cooperation of the youth of Kyrgyzstan to strengthen peace in society and prevent violent extremism" - Nazgul Zholdoshova, 31 years old, Kyrgyzstan. • "Intercultural and interreligious dialogue in Central Asia" - Nilufar Abdullo, 18 years old, Tajikistan. • "Empowering the youth" - Jawhara Mustafa, 20 years old, Egypt. • "International youth cooperation in the Republic of Tatarstan" – Liana Gatiiatullina, 21 years old, Tatarstan, Russian Federation. • "Challenges of the youth in Afghanistan" - Abdul Basit Musadiq, 20 years old, Afghanistan. • "The basic principles of working with teenagers on the example of the leadership school "Zhana Urpak" - Kazbek Kuykenov, 26 years old, Kazakhstan. • "Culture and Business - a bridge for dialogue and peace" - Akmaral Satinbaeva, 29 years old, Kyrgyzstan. For more information about speakers: Speakers BIO English.pdf . Recall that registration for the Youth Forum as participants continues and you still have the opportunity to gain experience and new skills in promoting intercultural dialogue, strengthening youth cooperation and preventing violent extremism.